It’s time to earn your turns. The mountains of New England provide incredible opportunities to dive into and test your ski mountaineering ability on objectives that are word renowned. Lincolns throat in Franconia, landslide Gully in Crawford notch, Monroe Brook on the west side of Mt Washington and of Tuckermans ravine are potential objectives. The Avalanche and weather forecast will be the ultimate decider. Most of the required equipment [listed below] - including Avalanche Transceiver, probe and shovel - is available for rent from our affiliate mtnGEAR. NEM climbers will receive an exclusive discount of 20% discount on all rental equipment and clothing. NOTE: We do not rent Alpine Touring Ski set-ups - but there are places in the valley that do! 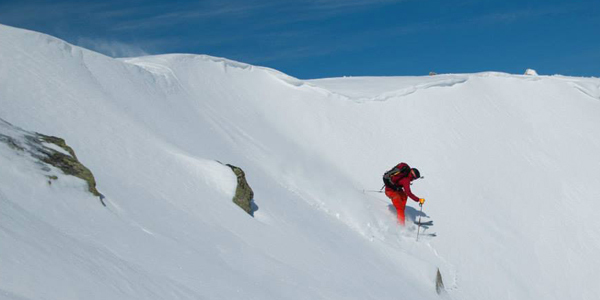 This adventure is designed for advanced backcountry skiers with previous experience! When selecting clothing for your adventure, think layers. Choose synthetic materials, wool, or fleece. The saying is "Cotton Kills." It will absorb sweat and then freeze - increasing the chances of hypothermia. Please Bring the Following Items. Snow pants will suffice instead of soft shell climbing pants and if you have insulating layers and jackets we recommend that you bring them. There will be time to sort through what you should bring and what you leave behind. Please read through the following frequently asked questions and answers. These will help you prepare for your trip and get a better understanding of what to expect. No, but to make the transition to the backcountry you must be a black diamond skier at the resorts minimum. What happens if the weather doesn't cooperate? We usually will go out in the rain and snow. Lightning will reschedule or end our course. Please plan for all weather conditions. We may just alter the plan based on the weather forecast. Am I supposed to tip my guide(s)? Tips are never expected, however if you think your guide did a great job, tips are welcomed and appreciated. A normal tip is 20% of the guide fees or $20 per guide per day. Can I rent the gear that I do not own? Most of the required equipment is available for rent from our affiliate mtnGEAR. NEM climbers will receive an exclusive discount of 20% discount on all rental equipment and clothing. We do not carry AT skiing setups. You will need to secure them from a local shop. These are ski boots designed for ski touring and backcountry skiing. They have functionalities that make skinning more enjoyable. We recommend The Bunkhouse at Northeast Mountaineering. For your convenience, we offer co-ed, hostel-style accommodations on site. The cost is $20 per person. To maximize your climbing experience, we recommend that you stay in the area the night before your climb. During the traverse, we will stay at the AMC Grey Knob Hut. How do I find out when and where to meet? Upon completion of your registration you will get a confirmation email with a link to all the pertinent information. You will be asked to secure your rental equipment and read through the welcome information to be prepared and on time for your course. Worried about avalanches? AIARE 1 Course should help ease the tension. Not Ready? Contact Us for a recommendation.